But, without further ado, here's my Tuesdays with Dorie (TWD) post. 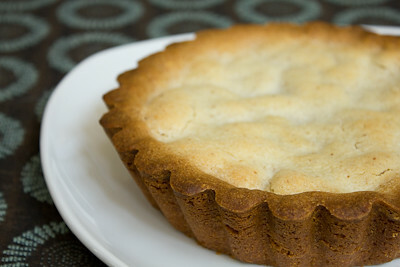 This week's recipe was chosen by Jeannette of The Whimsical Cupcake: Tourtely Apple Tart. This is about as homey as you can get. 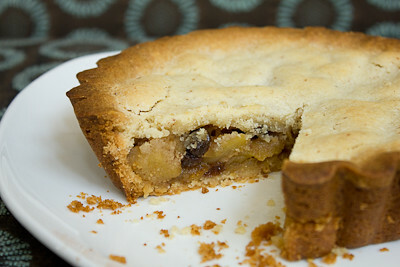 It's a filling of apples cooked in brown sugar, tossed together with nutty browned butter, raisins, and ground almonds. The aroma of the filling after is just made is simply amazing. I love browned butter. The filling is then sandwiched between two layers of sweet, sugary almond cookie dough. Thanks Jeannette, for hosting this week. If you would like the recipe, you can find it here. Make sure you check out the TWD Blogroll, to see how everyone else enjoyed this sweet, appley treat! - When baking your crust, instead of removing the foil completely after 20 minutes, gently remove it, cut a hole in the center to create a "pie crust shield," and then put it back over your tart. This will allow the center to brown without burning the edges of your crust. I forgot to do that this time, resulting in the very brown edges you see in my photos! I love your mini - I really wanted to scale mine back too but I just couldn't get motivated to do the math :) This is a definite repeat for me as well - a nice variation on apple pie that doesn't require me to deal with pie dough!